Star Control title screen for the IBM PC. This article is about the Star Control game. For information on the Star Control organization, see Star Control (Organization). 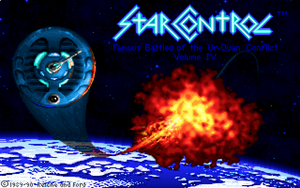 Star Control: Famous Battles of the Ur-Quan Conflict Volume IV was developed by Fred Ford and Paul Reiche III. It was released for the PC in 1990 and (in a somewhat cut-down form, and called simply Star Control) for the Commodore 64 in 1991 by Accolade. A port for the Sega Genesis was released by Ballistic in that same year. The DOS version is available from Good Old Games. Game play is a mixture of action and strategy. Players control fleets of ships and maneuver them about a star map, mining, colonizing, and fortifying planets while building up a fleet. When two (or more) enemy ships meet in orbit around a planet, they engage in a one-on-one dogfight to the death. This aspect of the game draws its inspiration from SPACEWAR! (written for the PDP-1). Two things set Star Control apart from various other SPACEWAR! 'clones' - the aspect of strategy and the diversity of the ships (leading to higher quality game play). Each ship has a unique weapon and special ability, as well as varied stats that affect its performance in combat directly. Players must learn the strengths and weaknesses of each vessel and how to cope with them. The game consisted of two sides: The Alliance of Free Stars, the protagonists (good guys), and the Ur-Quan Hierarchy, the antagonists (bad guys). As shown here, the Earthlings were not the most powerful, nor the center of the game. They were just one of many races. Their Cruiser vessel, though deadly in the right hands, was slow and third to last in point value. Star Control laid the foundations for Star Control II, a masterpiece of space exploration, combat, and diplomacy. Star Control and Star Control II are full of nods, influences, and references to other science fiction (and some non-scifi) sources. This page was last edited on 27 June 2013, at 09:13.